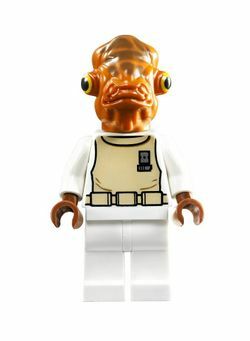 Admiral Ackbar is a minifigure first released in for the Star Wars theme. The Admiral Ackbar minifigure is made up of three pieces. The leg piece is plain white, and the torso is also primarily white. However, tan coloured printing is used on both the front and the back of the torso piece, along with black outlining to depict the Admiral's uniform. This printing also depicts a belt which can be seen at the bottom of the piece. Additionally, grey printing is used to represent Ackbar's rank insignia, located towards the top left-hand side of the torso. The hands on the torso piece are brown to match Mon Calamari's skin tone. Admiral Ackbar's head piece is a Mon Calamari mould, which made its first ever appearance on both Ackbar and the Mon Calamari Officer in the 7754 Home One Mon Calamari Star Cruiser. It has yellow and black printing for the eyes, and brown printing near the top, yet the brown printing in set 75003 is a bit darker than the printing in set 7754. Ackbar does not come with any accessories, however a transparent mug is provided for him on the bridge of the Home One set. He can also be found in a special collectible display set sold on Thursday 23 July 2009 at the San Diego Comic-Con International. He also appears in a magnet set. In 2013 he appears in the 75003 A-Wing Starfighter. Here, he also comes with a transparent mug, which he is shown to be holding on the backside of the box. Lego states in their Star Wars Visual Dictionary that they would put it in there because the toys are for fun. Additionally, Admiral Ackbar (Classic) "Can plug into Staff sockets", while Admiral Ackbar (Resistance) "Can accept Resistance missions". Ackbar was an Admiral in the Alliance Navy, and appointed the Supreme Commander of the Rebel Fleet and head of all Rebel military operations by Mon Mothma. Ackbar commanded the Alliance's Forces in the Battle of Endor onboard his ship, the Home One, this battle leading to the destruction of the second Death Star and the death of the Emperor. He is most famous for saying the line 'It's a Trap!' when he realizes that the Second Death Star is fully operational, and the Imperials Launch a Counter-Attack. Ackbar continued to serve as Admiral in the resistance after the defeat of the Empire and the rise of the First Order. Spoiler warning: Plot or ending details for Star Wars: Episode VIII The Last Jedi follow. Admiral Ackbar was killed during the First Order's attack on the Resistance fleet. Ackbar in LEGO Star Wars: The Complete Saga. Admiral Ackbar has made three video game appearances to date, the first being in LEGO Star Wars II: The Original Trilogy, then in LEGO Star Wars: The Complete Saga, and most recently in LEGO Star Wars III: The Clone Wars, he carries a gun. He also appears briefly in LEGO Star Wars: The Padawan Menace, hosting Ackbar Tonight. He then appears at the end saying "It's a wrap!". 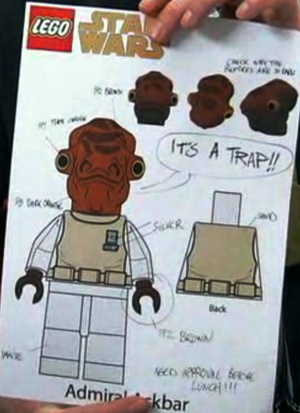 A prototype drawing of Admiral Ackbar. This page was last edited on 10 February 2019, at 00:12.